The AgDrone system is a completely autonomous UAS for agricultural surveying that comes standard with visible and multispectral cameras for high-resolution imaging and NDVI-based crop stress detection. The AgDrone system comes ready to fly with a complete airframe and avionics, fully configured autopilot, mission planning software, and integrated sensors tailored for agriculture. 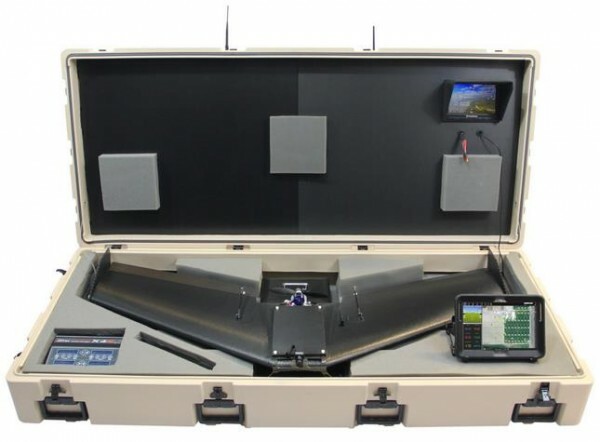 HoneyComb's AgDrone system is a complete aerial imaging solution that includes the AgDrone UAV, tablet, carrying case, antennas, batteries, charger, and all other components required for a fully deployable system on day 1. Complete specifications are provided below for our base system, which includes visible and multispectral (NDVI) imaging standard. NDVI image of a Filbert/Hazelnut orchard. Stressed trees were identified using aerial imagery from the AgDrone UAS. Crop stress detected in vegetables. A transplant issue was identified (dark) and an irrigation problem caused a dead row (left). Visible imagery used to check sprinkler line for adequate performance. The entire line was imaged during the flight. A leak was found in the main irrigation line. Quick identification allowed the farm to fix the issue, saving resources. Bare spots were identified and measured using aerial imagery. Gaining an aerial view can reveal a powerful perspective. Get a quick view of your entire flight with fast mosaicking and high-resolution tiling from the AgDrone UAS.